Michael (Hebrew pronunciation: [mixaˈʔel]; Hebrew: מִיכָאֵל‎, translit. Mîkhā'ēl, lit. 'Who is like God? '; Greek: Μιχαήλ, translit. Mikhaḗl; Latin: Michahel; Coptic: ⲙⲓⲭⲁⲏⲗ; Arabic: ميخائيل ، مِيكَالَ ، ميكائيل‎, translit. Mīkā'īl, Mīkāl or Mīkhā'īl, lit. 'Man Ka El? = من كإيل/كإله/كالله؟') is an archangel in Judaism, Christianity, and Islam. In Roman Catholic, Eastern Orthodox, Anglican, and Lutheran systems of faith, he is called "Saint Michael the Archangel" and "Saint Michael". In the Oriental Orthodox and Eastern Orthodox religions, he is called "Saint Michael the Taxiarch". Michael is mentioned three times in the Book of Daniel. The idea that Michael was the advocate of the Jews became so prevalent[when?] that, in spite of the rabbinical prohibition against appealing to angels as intermediaries between God and his people, Michael came to occupy a certain place in the Jewish liturgy[where?]. In the New Testament Michael leads God's armies against Satan's forces in the Book of Revelation, where during the war in heaven he defeats Satan. In the Epistle of Jude Michael is specifically referred to as "the archangel Michael". Catholic sanctuaries to Michael appeared in the 4th century, when he was first seen as a healing angel, and then over time as a protector and the leader of the army of God against the forces of evil. Guido Reni's Michael (in Santa Maria della Concezione church, Rome, 1636) tramples Satan. A mosaic of the same painting decorates St. Michael's Altar in St. Peter's Basilica. Michael is mentioned three times in the Hebrew Bible (the Old Testament), all in the Book of Daniel. The prophet Daniel experiences a vision after having undergone a period of fasting. Daniel 10:13-21 describes Daniel's vision of an angel who identifies Michael as the protector of Israel. At Daniel 12:1, Daniel is informed that Michael will arise during the "time of the end". The Book of Revelation (12:7-9) describes a war in heaven in which Michael, being stronger, defeats Satan. After the conflict, Satan is thrown to earth along with the fallen angels, where he ("that ancient serpent called the devil") still tries to "lead the whole world astray". In the Epistle of Jude 1:9, Michael is referred to as an "archangel" when he again confronts Satan. A reference to an "archangel" also appears in the First Epistle to the Thessalonians 4:16. This archangel who heralds the second coming of Christ is not named, but is often associated with Michael (among others). Michael (Arabic: ميخائيل Mīkhā‘īl, ميكائيل Mīkā‘īl ), is one of the two archangels mentioned in the Quran, alongside Jibrail (Gabriel), while in non-Qur'anic sources, such as Sahih Muslim, "Israfil" (sometimes spelled, "Israfel") is yet another Islamic 'archangel'. In the Quran, Michael is mentioned once only, in Sura 2:98: "Whoever is an enemy to God, and His angels and His messengers, and Jibrail and Mikhail! Then, God (Himself) is an enemy to the disbelievers." Some Muslims[specify][vague][who?] believe that the reference in Sura 11:69 is Michael, one of the three angels who visited Abraham. According to rabbinic Jewish tradition, Michael acted as the advocate of Israel, and sometimes had to fight with the princes of the other nations (cf. 10:13) and particularly with the angel Samael, Israel's accuser. Michael's enmity with Samael dates from the time when the latter was thrown down from heaven. Samael took hold of the wings of Michael, whom he wished to bring down with him in his fall; but Michael was saved by God. Michael said "May The Lord rebuke you" to Satan for attempting to claim the body of Moses. The idea that Michael was the advocate of the Jews became so prevalent[where?] that in spite of the rabbinical prohibition against appealing to angels as intermediaries between God and his people, Michael came to occupy a certain place in the Jewish liturgy: "When a man is in need he must pray directly to God, and neither to Michael nor to Gabriel." There were two prayers written beseeching him as the prince of mercy to intercede in favor of Israel: one composed by Eliezer ha-Kalir, and the other by Judah ben Samuel he-Hasid[when?]. But appeal to Michael seems to have been more common in ancient times[where?][when?]. Thus Jeremiah is said to have addressed a prayer to him. The rabbis declare that Michael entered upon his role of defender at the time of the biblical patriarchs. Thus, according to Rabbi Eliezer ben Jacob, it was Michael who rescued Abraham from the furnace into which he had been thrown by Nimrod (Midrash Genesis Rabbah xliv. 16). It was Michael, the "one that had escaped" (Genesis 14:13), who told Abraham that Lot had been taken captive (Midrash Pirke R. El. ), and who protected Sarah from being defiled by Abimelech. He announced to Sarah that she would bear a son and he rescued Lot at the destruction of Sodom. It is said that Michael prevented Isaac from being sacrificed by his father by substituting a ram in his place, and saved Jacob, while yet in his mother's womb, from being killed by Samael. Later Michael prevented Laban from harming Jacob. (Pirke De-Rabbi Eliezer, xxxvi). It was Michael who wrestled with Jacob and who afterwards blessed him. The midrash Exodus Rabbah holds that Michael exercised his function of advocate of Israel at the time of the Exodus also when Satan (as an adversary) accused the Israelites of idolatry and declared that they were consequently deserving of death by drowning in the Red Sea. Michael is also said to have destroyed the army of Sennacherib. Michael was later venerated as a healer in Catholic Phrygia (modern-day Turkey). The earliest and most famous Catholic sanctuary to Michael in the ancient Near East was also associated with healing waters. It was the Michaelion built in the early 4th century by Emperor Constantine at Chalcedon, on the site of an earlier Temple called Sosthenion. A painting of the Archangel slaying a serpent became a major art piece at the Michaelion after Constantine defeated Licinius near there in 324, eventually leading to the standard iconography of Archangel Michael as a warrior saint slaying a dragon. The Michaelion was a magnificent church and in time became a model for hundreds of other churches in Eastern Christianity which spread devotions to the Archangel. In the 4th century, Saint Basil the Great's homily (De Angelis) placed Saint Michael over all the angels. He was called "Archangel" because he heralds other angels, the title Αρχαγγέλος (archangelos) being used of him in Jude 1:9. Into the 6th century, the view of Michael as a healer continued in Rome; where after a plague, the sick slept at night in the church of Castel Sant'Angelo (dedicated to him for saving Rome), waiting for his manifestation. In the 6th century, the growth of devotions to Michael in the Western Church was manifested by the feasts dedicated to him, as recorded in the Leonine Sacramentary. The 7th-century Gelasian Sacramentary included the feast "S. Michaelis Archangeli", as did the 8th-century Gregorian Sacramentary. Some of these documents refer to a no longer extant Basilica Archangeli on via Salaria in Rome. The angelology of Pseudo-Dionysius which was widely read as of the 6th century gave Michael a rank in the celestial hierarchy. Later, in the 13th century, others such as Bonaventure believed that he is the prince of the Seraphim, the first of the nine angelic orders. According to Thomas Aquinas (Summa Ia. 113.3), he is the Prince of the last and lowest choir, the Angels. For Roman Catholic views and prayers, see Saint Michael (Roman Catholic). 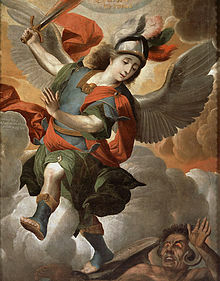 Catholics often refer to Michael as "Holy Michael, the Archangel" or "Saint Michael", a title that does not indicate canonisation. He is generally referred to in Christian litanies as "Saint Michael", as in the Litany of the Saints. In the shortened version of this litany used in the Easter Vigil, he alone of the angels and archangels is mentioned by name, omitting Saint Gabriel and Saint Raphael. In the Roman Catholic teachings Saint Michael has four main roles or offices. His first role is the leader of the Army of God and the leader of heaven's forces in their triumph over the powers of hell. He is viewed as the angelic model for the virtues of the spiritual warrior, with the conflict against evil at times viewed as the battle within. The second and third roles of Michael in Catholic teachings deal with death. In his second role, Michael is the angel of death, carrying the souls of all the deceased to heaven. In this role Michael descends at the hour of death, and gives each soul the chance to redeem itself before passing; thus consternating the devil and his minions. Catholic prayers often refer to this role of Michael. In his third role, he weighs souls in his perfectly balanced scales. For this reason, Michael is often depicted holding scales. 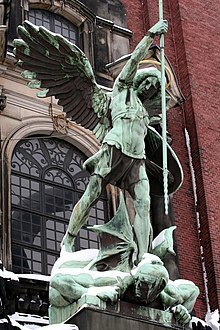 In his fourth role, Saint Michael, the special patron of the Chosen People in the Old Testament, is also the guardian of the Church; it was thus not unusual for the angel to be revered by the military orders of knights during the Middle Ages. Thus, the nomenclature of villages around the Bay of Biscay reflects that history. This role also extends to his being the patron saint of a number of cities and countries. Roman Catholicism includes traditions such as the Prayer to Saint Michael which specifically asks for the faithful to be "defended" by the saint. The Chaplet of Saint Michael consists of nine salutations, one for each choir of angels. The Eastern Orthodox accord Michael the title "Archistrategos", or "Supreme Commander of the Heavenly Hosts". The Eastern Orthodox pray to their guardian angels and above all to Michael and Gabriel. The Eastern Orthodox have always had strong devotions to angels, and the trend continues to date with the term "Bodiless Powers" applied to them. A number of feasts dedicated to Archangel Michael are celebrated by the Eastern Orthodox throughout the year. Archangel Michael is mentioned in a number of Eastern Orthodox hymns and prayer, and his icons are widely used within Eastern Orthodox churches. In many Eastern Orthodox icons, Christ is accompanied by a number of angels, Michael being a predominant figure among them. In Russia, many monasteries, cathedrals, court and merchant churches are dedicated to the Chief Commander Michael, and most Russian cities have a church or chapel dedicated to the Archangel Michael. The place of Michael in the Coptic Orthodox Church of Alexandria is as a saintly intercessor, where he is seen as the one: who presents to God the prayers of the just, who accompanies the souls of the dead to heaven, who defeats the devil. He is celebrated liturgically on the 12th of each Coptic month. In Alexandria, a church was dedicated to him in the early fourth century on the 12th of the month of Paoni and on the 12th of the month of Hathor is the celebration of Michael's appointment in heaven, where Michael became the chief of the angels. Protestant denominations[specify][vague][who?] generally recognize Michael as an archangel. Jacobus Ode, Campegius Vitringa, Sr.
for even before them, the Jewish commentators, such as Wetstein, Surenhusius, etc. In the 19th Century, Charles Haddon Spurgeon stated that Jesus is "the true Michael"  and “the only Archangel”, and that he is God the Son, and co-equal to the Father. Within Anglicanism, the controversial bishop Robert Clayton (died 1758) proposed that Michael was the Logos and Gabriel the Holy Spirit. Controversy over Clayton's views led the government to order his prosecution, but he died before his scheduled examination. Michael continues to be recognized[specify][vague][who? ]among Protestants by key churches dedicated to him, e.g., St. Michaelis Church, Hamburg and St. Michael's Church, Hildesheim, each of which is of the Lutheran Church and has appeared in the Bundesländer series of €2 commemorative coins for 2008 and 2014 respectively. In Bach's time, the annual feast of Michael and All the Angels on 29 September was regularly celebrated with a festive service, for which Bach composed several cantatas, for example the chorale cantata Herr Gott, dich loben alle wir, BWV 130 in 1724, Es erhub sich ein Streit, BWV 19, in 1726 and Man singet mit Freuden vom Sieg, BWV 149, in 1728 or 1729. Seventh-day Adventists, believe that Michael is another name for the eternal Son of the Father, the Heavenly Christ, and another name for the Word-of-God (as in John 1) before he became incarnate as Jesus. "Archangel" (meaning "Chief of the Angels", "highest messenger") was the leadership position as held by the Word-of-God as Michael while among the angels. According to Adventist theology, Michael was considered the "eternal Word", and not a created being or created angel, and the one by whom all things were created. The Word was then born incarnate as Jesus. Seventh-day Adventists believe the name "Michael" is significant in showing who he is, just as "Immanuel" (which means "God with us") is about who Jesus is. They believe that name "Michael" signifies "one who is God" and that as the "Archangel" or "chief or head of the angels" he led the angels and thus the statement in Revelation 12:7-9 identifies Jesus as Michael. In the Seventh-day Adventist view, the statement in some translations of 1 Thessalonians 4:13-18: "For the Lord himself shall descend from heaven, with a shout, with the voice of the archangel, and with the trump of God" identifies Jesus as Archangel, which is Michael. (Other translations have "For the Lord himself will descend from heaven with a cry of command, with the voice of an archangel, and with the sound of the trumpet of God.") And the Seventh-day Adventists believe that John 5:25-29 also confirms that Jesus and Michael are the same. Because of this belief that the Archangel Michael and Jesus Christ are one in the same, many mainstream theologians and academics[specify][vague][who?] in the field of Judeo-Christian history place Seventh Day Adventists in a unique category as a branch of, yet outside, mainstream Christianity. Jehovah's Witnesses believe Michael to be another name for Jesus in heaven, in his pre-human and post-resurrection existence. They say the definite article at Jude 9—referring to "Michael the archangel"—identifies Michael as the only archangel. They consider Michael to be synonymous with Christ, described at 1 Thessalonians 4:16 as descending "with a cry of command, with the voice of an archangel, and with the sound of the trumpet". They believe the prominent roles assigned to Michael at Daniel 12:1 and Revelation 12:7, 19:14, 16, are identical to Jesus' roles, being the one chosen to lead God's people and as the only one who "stands up", identifying the two as the same spirit being. Because they identify Michael with Jesus, he is therefore considered the first and greatest of all God's heavenly sons, God's chief messenger, who takes the lead in vindicating God's sovereignty, sanctifying his name, fighting the wicked forces of Satan and protecting God's covenant people on earth. Jehovah's Witnesses also identify Michael with the "Angel of the Lord" who led and protected the Israelites in the wilderness. Latter-day Saints (also known informally as Mormons) believe that Michael is Adam, the Ancient of Days (Dan. 7), a prince, and the patriarch of the human family. Also, they hold that Michael assisted Jehovah (the heavenly form of Jesus) in the creation of the world under the direction of God the Father and cast Satan out of heaven. This illustration from Walters manuscript W.659 depicts the Archangel Michael (Mika'il). In Islam, Michael, also spelt Mika'il, is one of the archangels and said to be responsible for the forces of nature. From the tears of Michael, angels are created. Such angels are the helpers of Michael. Whoever is an enemy to Allah and His angels and messengers, to Gabriel and Michael, – Lo! Allah is an enemy to those who reject Faith. In Sunni Islam, Michael appears in the creation narrative of Adam. Accordingly, he was sent to bring a handful of earth; but the Earth not yield a piece of itself, some of which will burn. This is articulated by Al-Tha'labi whose narrative states that God will tell Earth that some will obey him and others not. "O' Allah! Bestow your blessing on Michael-angel of Your mercy and created for kindness and seeker of pardon for and supporter of the obedient people." The French occultist, Eliphas Levi, the German philosopher Franz von Baader, and the Theosophist Louis Claude de St. Martin spoke of 1879 as the year in which Michael overcame the dragon. In 1917, Rudolf Steiner, the founder of anthroposophy, similarly stated, "in 1879, in November, a momentous event took place, a battle of the Powers of Darkness against the Powers of Light, ending in the image of Michael overcoming the Dragon". In the General Roman Calendar, the Anglican Calendar of Saints, and the Lutheran Calendar of Saints, the archangel's feast is celebrated on Michaelmas Day, 29 September. The day is also considered the feast of Saints Michael, Gabriel, and Raphael, in the General Roman Calendar and the Feast of Saint Michael and All Angels according to the Church of England. In the Eastern Orthodox Church, Saint Michael's principal feast day is 8 November (those that use the Julian calendar celebrate it on what in the Gregorian calendar is now 21 November), honouring him along with the rest of the "Bodiless Powers of Heaven" (i.e. angels) as their Supreme Commander, and the Miracle at Chonae is commemorated on 6 September. In the calendar of the Church of England diocese of Truro, 8 May is the feast of St. Michael, Protector of Cornwall. The archangel Michael is one of the three patron saints of Cornwall. In the Coptic Orthodox Church, the main feast day in 12 Hathor and 12 Paoni, and he is celebrated liturgically on the 12th of each Coptic month. In late medieval Christianity, Michael, together with Saint George, became the patron saint of chivalry and is now also considered the patron saint of police officers, paramedics and the military. Since the victorious Battle of Lechfeld against the Hungarians in 955, Michael was the patron saint of the Holy Roman Empire and still is the patron saint of modern Germany and other German-speaking regions formerly covered by the realm. In mid to late 15th century, France was one of only four courts in Western Christendom without an order of knighthood. Later in the 15th century, Jean Molinet glorified the primordial feat of arms of the archangel as "the first deed of knighthood and chivalrous prowess that was ever achieved." Thus Michael was the natural patron of the first chivalric order of France, the Order of Saint Michael of 1469. In the British honours system, a chivalric order founded in 1818 is also named for these two saints, the Order of St Michael and St George. 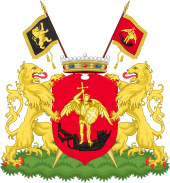 The Order of Michael the Brave is Romania's highest military decoration. Prior to 1878, the Scapular of St. Michael the Archangel could be worn as part of a Roman Catholic Archconfraternity. Presently, enrollment is authorized as this holy scapular remains as one of the 18 approved by the Church. Apart from his being a patron of warriors, the sick and the suffering also consider Archangel Michael their patron saint. Based on the legend of his 8th-century apparition at Mont-Saint-Michel, France, the Archangel is the patron of mariners in this famous sanctuary. 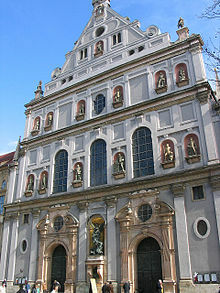 After the evangelisation of Germany, where mountains were often dedicated to pagan gods, Christians placed many mountains under the patronage of the Archangel, and numerous mountain chapels of St. Michael appeared all over Germany. Similarly, the Sanctuary of St. Michel (San Migel Aralarkoa), the oldest Christian building in Navarre (Spain), lies at the top of a hill on the Aralar Range, and harbours Carolingian remains. 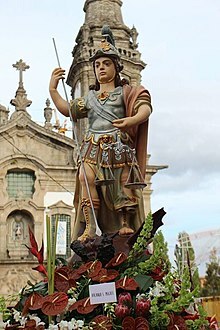 St. Michel is an ancient devotion of Navarre and eastern Gipuzkoa, revered by the Basques, shrouded in legend, and held as a champion against paganism and heresy. It came to symbolize the defense of Catholicism, as well as Basque tradition and values during the early 20th century. He has been the patron saint of Brussels since the Middle Ages. 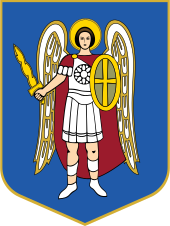 The city of Arkhangelsk in Russia is named for the Archangel. Ukraine and its capital Kiev also consider Michael their patron saint and protector. Since the 14th century, Saint Michael has been the patron saint of Dumfries in Scotland, where a church dedicated to him was built at the southern end of the town, on a mound overlooking the River Nith. An Anglican sisterhood dedicated to Saint Michael under the title of the Community of St Michael and All Angels was founded in 1851. The Congregation of Saint Michael the Archangel (CSMA), also known as the Michaelite Fathers, is a religious order of the Roman Catholic Church founded in 1897. The Canons Regular of the Order of St Michael the Archangel (OSM) are an Order of professed religious within the Anglican Church in North America, the North American component of the Anglican realignment movement. There is a legend which seems to be of Jewish origin, and which was adopted by the Copts, to the effect that Michael was first sent by God to bring Nebuchadnezzar (c. 600 BC) against Jerusalem, and that Michael was afterward very active in freeing his nation from Babylonian captivity. According to midrash Genesis Rabbah, Michael saved Hananiah and his companions from the Fiery furnace. Michael was active in the time of Esther: "The more Haman accused Israel on earth, the more Michael defended Israel in heaven". It was Michael who reminded Ahasuerus that he was Mordecai's debtor; and there is a legend that Michael appeared to the high priest Hyrcanus, promising him assistance. According to Legends of the Jews, archangel Michael was the chief of a band of angels who questioned God's decision to create man on earth. The entire band of angels, except for Michael, was then consumed by fire. A 12th-century icon of the Miracle at Chonae, from Saint Catherine's Monastery, Mount Sinai. The Portuguese Carmelite nun, Antónia d'Astónaco, reported an apparition and private revelation of the Archangel Michael. The Orthodox Church celebrates the Miracle at Chonae on September 6. The pious legend surrounding the event states that John the Apostle, when preaching nearby, foretold the appearance of Michael at Cheretopa near Lake Salda, where a healing spring appeared soon after the Apostle left; in gratitude for the healing of his daughter, one pilgrim built a church on the site. Local pagans, who are described as jealous of the healing power of the spring and the church, attempt to drown the church by redirecting the river, but the Archangel, "in the likeness of a column of fire", split the bedrock to open up a new bed for the stream, directing the flow away from the church. The legend is supposed to have predated the actual events, but the 5th – 7th-century texts that refer to the miracle at Chonae formed the basis of specific paradigms for "properly approaching" angelic intermediaries for more effective prayers within the Christian culture. There is a late-5th-century legend in Cornwall, UK that the Archangel appeared to fishermen on St Michael's Mount. According to author Richard Freeman Johnson this legend is likely a nationalistic twist to a myth. Cornish legends also hold that the mount itself was constructed by giants and that King Arthur battled a giant there. The legend of the apparition of the Archangel at around 490 AD at a secluded hilltop cave on Monte Gargano in Italy gained a following among the Lombards in the immediate period thereafter, and by the 8th century pilgrims arrived from as far away as England. The Tridentine Calendar included a feast of the apparition on 8 May, the date of the 663 victory over the Greek Neapolitans that the Lombards of Manfredonia attributed to Saint Michael. The feast remained in the Roman liturgical calendar until removed in the revision of Pope John XXIII. The Sanctuary of Monte Sant'Angelo at Gargano is a major Catholic pilgrimage site. According to Roman legends, Archangel Michael appeared with a sword over the mausoleum of Hadrian while a devastating plague persisted in Rome, in apparent answer to the prayers of Pope St Gregory I the Great (c. 590–604) that the plague should cease. After the plague ended, in honor of the occasion, the pope called the mausoleum "Castel Sant'Angelo" (Castle of the Holy Angel), the name by which it is still known. 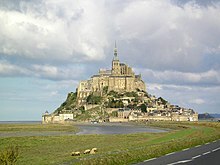 According to Norman legend, Michael is said to have appeared to St Aubert, Bishop of Avranches, in 708, giving instruction to build a church on the rocky islet now known as Mont Saint-Michel. In 960 the Duke of Normandy commissioned a Benedictine abbey on the mount, and it remains a major pilgrimage site. A Portuguese Carmelite nun, Antónia d'Astónaco, reported an apparition and private revelation of the Archangel Michael who had told to this devoted Servant of God, in 1751, that he would like to be honored, and God glorified, by the praying of nine special invocations. These nine invocations correspond to invocations to the nine choirs of angels and origins the famous Chaplet of Saint Michael. This private revelation and prayers were approved by Pope Pius IX in 1851. From 1961 to 1965, four young schoolgirls had reported several apparitions of Archangel Michael in the small village of Garabandal, Spain. At Garabandal, the apparitions of the Archangel Michael were mainly reported as announcing the arrivals of the Virgin Mary. The Catholic Church has neither approved nor condemned the Garabandal apparitions. In Islam, Mikail (Michael) is one of the four archangels along with Jibrail, Israfil and Azrail. The Quran mentions him in 2:98. He provides nourishments for bodies and souls and is also responsible for nature events. Mikail is often depicted as the archangel of mercy. Therefore, he is said to be friendly, asking God for mercy for humans and is said to be one of the first who bowed down before Adam. Furthermore, he is responsible for the rewards doled out to good persons in this life. In the English epic poem Paradise Lost by John Milton, Michael commands the army of angels loyal to God against the rebel forces of Satan. Armed with a sword from God's armory, he bests Satan in personal combat, wounding his side. Most Jewish teachings interpret the Second Commandment as against the use of "graven images" as visual art. Islamic art's focus on calligraphy, rather than painting and sculpture, similarly derives from the association of idolatry with the depiction of human or angelic forms. 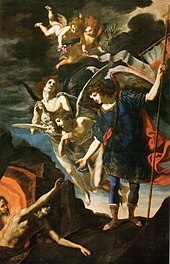 In Christian art, Archangel Michael may be depicted alone or with other angels such as Gabriel. Some depictions with Gabriel date back to the 8th century, e.g. the stone casket at Notre Dame de Mortain church in France. The widely reproduced image of Our Mother of Perpetual Help, an icon of the Cretan school, depicts Michael on the left carrying the lance and sponge of the crucifixion of Jesus, with Gabriel on the right side of Mary and Jesus. In many depictions Michael is represented as an angelic warrior, fully armed with helmet, sword, and shield. The shield may bear the Latin inscription Quis ut Deus or the Greek inscription Christos Dikaios Krites or its initials. He may be standing over a serpent, a dragon, or the defeated figure of Satan, whom he sometimes pierces with a lance. 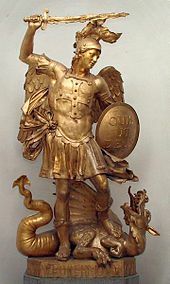 The iconography of Michael slaying a serpent goes back to the early 4th century, when Emperor Constantine defeated Licinius at the Battle of Adrianople in 324 AD, not far from the Michaelion a church dedicated to Archangel Michael. Constantine felt that Licinius was an agent of Satan, and associated him with the serpent described in the Book of Revelation (12:9). After the victory, Constantine commissioned a depiction of himself and his sons slaying Licinius represented as a serpent - a symbolism borrowed from the Christian teachings on the Archangel to whom he attributed the victory. 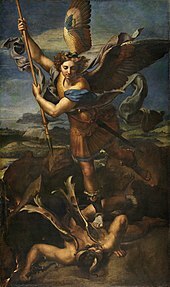 A similar painting, this time with the Archangel Michael himself slaying a serpent then became a major art piece at the Michaelion and eventually lead to the standard iconography of Archangel Michael as a warrior saint. In other depictions Michael may be holding a pair of scales in which he weighs the souls of the departed and may hold the book of life (as in the Book of Revelation), to show that he takes part in the judgment. However this form of depiction is less common than the slaying of the dragon. Michelangelo depicted this scene on the altar wall of the Sistine Chapel. 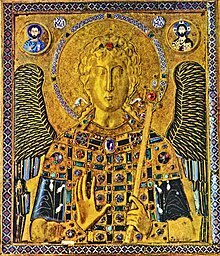 In Byzantine art Michael was often shown as a princely court dignitary, rather than a warrior who battled Satan or with scales for weighing souls on the Day of Judgement. Bronze statue of Archangel Michael, standing on top of the Castel Sant'Angelo, modelled in 1753 by Peter Anton von Verschaffelt (1710–1793). Michael's icon on the northern deacons' door on the iconostasis of Hajdúdorog. The archangel is often depicted on iconostases' doors as a defender of the sanctuary. Archangel Michael by Emily Young in the grounds of St Pancras New Church. Plaque inscription: "In memory of the victims of the 7th July 2005 bombings and all victims of violence. 'I will lift up my eyes unto the hills' Psalm 121"
St. Michael's Golden-Domed Monastery in Kiev (Ukraine). Castel Sant'Angelo in Rome, with Michael's statue atop. For a larger gallery (and hence a structured list) of church images, please see: Saint Michael church gallery. ^ "Bible gateway, Daniel 12:1". Biblegateway.com. Retrieved 2010-07-21. ^ "Benedict XVI joins Pope Francis in consecrating Vatican to St Michael Archangel". news.va. Retrieved 2013-07-05. ^ "St. Michael, Patron Saint of Police Officers". Jcpdes.com. Retrieved 2012-12-27. ^ Finley, Mitch (2011). The Patron Saints Handbook. The Word Among Us Press. p. 72. ISBN 978-1-59325403-2. Retrieved 2014-05-01. ^ "St. Michael, the Archangel - Saints & Angels - Catholic Online". Catholic.org. Retrieved 2012-12-27. ^ "List of books attesting the title of "Saint Michael the Taxiarch"" (in English and German). ^ B. Osswald (PhD) (2008). "From Lieux de Pouvoir to Lieux de Mémoire: The Monuments of the Medieval Castle of Ioannina through the Centuries". Edizioni Plus-Pisa University Press. ISBN 978-88-8492-558-9. Archived from the original on 1 August 2018. ^ a b "John A. Lees, "Michael" in James Orr (editor), ''The International Standard Bible Encyclopedia''(Eerdmans 1939)". Internationalstandardbible.com. 2007-07-06. Retrieved 2012-12-27. ^ "Bible Hub commentaries on 1 Thessalonians 4:16". ^ "Jewish Encyclopedia - Michael". Jewish Encyclopedia. Retrieved 2009-02-18. ^ Cadwallader, Alan H.; Michael Trainor (2011). Colossae in Space and Time. Vandenhoeck & Ruprecht. p. 323. ISBN 978-3-525-53397-0. Retrieved 2012-12-27. ^ Butler 1821, p. 117. ^ a b Michael McGrath, Patrons and Protectors. Liturgy Training, 2001. ISBN 1-56854-109-0. ^ "Prayer to St Michael". EWTN. ^ Amy Welborn, The Words We Pray. Loyola Press, 2004. ISBN 0-8294-1956-X, page 101. ^ Baun, Jane (2007). Tales from Another Byzantium. Cambridge University Press. p. 391 et passim. ISBN 978-0-521-82395-1. Retrieved 2012-12-27. ^ a b The Baptist Confession of Faith (1689) - With slight revisions by C. H. Spurgeon Archived 2010-04-07 at the Wayback Machine - spurgeon.org - Phillip R. Johnson - 2001 - Retrieved 12 September 2014. ^ Morning and Evening - Charles Haddon Spurgeon - Devotionals by Spurgeon Sermons - Spurgeon Sermons with C.H. Spurgeon - Retrieved 12 September 2014. ^ The Angelic Life - Charles Haddon Spurgeon - Sermon No. 842. ^ "The Remnant". Adventist World. Archived from the original on 2012-07-24. Retrieved 2011-12-05. ^ Seventh-day Adventists Answer Questions on Doctrine, Review and Herald Publishing Association, Washington, D.C., 1957. Chapter 8 "Christ, and Michael the Archangel". ^ a b Bible readings for the home by 7th Day Adventists. London. 1949. p. 266. ^ Insight on the Scriptures. 2. Watch Tower Society. pp. 393–394. Retrieved 2013-05-01. ^ What Does the Bible Really Teach?. Watch Tower Society. pp. 218–219. Retrieved 2013-05-01. ^ "Angels—How They Affect Mankind". The Watchtower. Watch Tower Society: 21–25. March 15, 2007. Retrieved 2013-05-01. ^ What Does The Bible Really Teach?. Watch Tower Society. p. 87. ^ "Your Leader Is One, the Christ". The Watchtower: 21. September 15, 2010. ^ MACDONALD, JOHN. THE CREATION OF MAN AND ANGELS IN THE ESCHATOLOGICAL LITERATURE: [TRANSLATED EXCERPTS FROM AN UNPUBLISHED COLLECTION OF TRADITIONS]. Islamic Studies, vol. 3, no. 3, 1964, pp. 285–308. JSTOR, www.jstor.org/stable/20832755. ^ Steiner, Rudolf (1994) . Christopher Bamford (ed.). The Archangel Michael. Hudson, NY: Anthroposophic Press. ISBN 0-88010-378-7. ^ Noted by Johan Huizinga, The Waning of the Middle Ages (1919, 1924:56. ^ Dronda, Javier (2013). Con Cristo o contra Cristo: Religión y movilización antirrepublicana en Navarra (1931-1936). Tafalla: Txalaparta. pp. 54–55. ISBN 978-84-15313-31-1. ^ "History of Dumfries". loreburne.co.uk. Retrieved 29 November 2017. ^ Makarios of Simonos Petra, The Synaxarion: the Lives of the Saints of the Orthodox Church, trans. Christopher Hookway (Holy Convent of the Annunciation of Our Lady 1998 ISBN 960-85603-7-3), p. 47. ^ Peers, Glenn (2001). Subtle bodies: representing angels in Byzantium. University of California Press. p. 144. ISBN 0-520-22405-1. ^ "Center for Muslim-Jewish Engagement". Usc.edu. Archived from the original on 2015-02-02. Retrieved 2015-01-28. ^ "Vatican website: Sistine Chapel". Vaticanstate.va. Archived from the original on 2010-05-26. Retrieved 2010-07-21. Wikimedia Commons has media related to Archangel Michael.